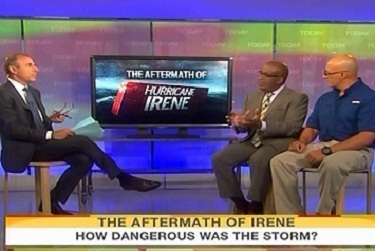 On Monday's NBC Today, co-host Matt Lauer introduced a panel discussion on whether media coverage of Hurricane Irene was overdone by proclaiming: "Was this storm over-hyped? In some ways, it's a one-sentence argument, this storm killed more than 20 people and 4 million people are without power, and clearly there's misery and destruction. How could it have been over-hyped?" Weatherman Al Roker completely dismissed the notion: "You look at the predictions, you look at the track, which was right on the money. And it is a Category 3 storm. There is no – there's no argument here....The preparations – everything that was done, I would say we should do over again if we get the same scenario." Weather Channel Meteorologist Jim Cantore chimed in: "How many more times do we have to play pictures [of flooding] in Vermont?" Lauer asked Weather Channel meteorologist Bryan Norcross, "You hear people complaining about the government reaction to this, where there were these evacuations of some 300,000 people in lower Manhattan, a million people along the Jersey shore and they say, 'We didn't have to leave our homes.' How would you respond?" Norcross argued: "Well, the fact is, Matt, if I were to say to you that there's a one in ten chance that you're going to die if you don't fix that wheel on your car when you leave the studio this morning, probably you'd fix it and most people would fix it. But not everybody would." Roker, Cantore, and Norcross were all guilty of over-hyping the storm as it approached the east coast. On Thursday's Nightly News, anchor Brian Williams turned to Norcross and described him as "a veteran hurricane specialist, very mindful of how much of a history-maker this storm could be." Norcross then declared: "We don't think that a significant probably hurricane of a lifetime type event can be avoided....we don't see how a major, major significant hurricane event can be avoided." Later on the same broadcast, Cantore told Williams: "Well, it's kind of unthinkable and hard to imagine, Brian. Back in 1960, right where I'm standing, there was 11 feet of water over my head from a hurricane named Donna. And, again, that was a storm that went to our east. So there's very little room for error here....This will be a multi-hazard hurricane..."
On Friday's Today, Roker announced: "It comes up as a Category 2 up along the coast; however, it may still intensify because conditions are right for that right now. So by later this afternoon, could be a Category 3 storm...continues to hug the coast. And this is probably one of the most dangerous paths if it continues. Comes onshore in New York City or Long Island as a Category 2 storm." He concluded: "This could be – we're just stressing 'could be'...a catastrophic event up and down the Eastern Seaboard for 65 million Americans." MATT LAUER: Let's bring back in Al, along with the Weather Channel's Jim Cantore and Bryan Norcross. Good morning to all of you. Jim and Al, let's start with you. And here's the argument, was this storm over-hyped? In some ways, it's a one-sentence argument, this storm killed more than 20 people and 4 million people are without power, and clearly there's misery and destruction. How could it have been over-hyped? And yet people still question it. Why? AL ROKER: You look at the predictions, you look at the track, which was right on the money. And it is a Category 3 storm. There is no – there's no argument here. LAUER: So what's bugging people? Because there are some people who are bugged by this? What's bugging them? JIM CANTORE: If we could make half the progress with intensity forecasts as we've made with track forecasts, this would be – this would be better, but we didn't do that. And we thought this was going to be a Cat 4 coming to the Outer Banks and then eventually a Cat 2 to the south of New York, that's the big difference. LAUER: And the fact of the matter is – Bryan, I'll get you in here in a second – the fact of the matter is the same people who are yelling that this storm was over-hyped might have been yelling, had you downplayed this storm, and it had been more severe than you thought. ROKER: Think about this. This is a – a minimal Category 1 storm. 23 people have lost their lives. How many more people would have died or could have died if this had been a stronger storm? The preparations – everything that was done, I would say we should do over again if we get the same scenario. CANTORE: How many more times do we have to play pictures in Vermont? LAUER: And yet, Bryan, you hear people complaining about the government reaction to this, where there were these evacuations of some 300,000 people in lower Manhattan, a million people along the Jersey shore and they say, 'We didn't have to leave our homes.' How would you respond? BRYAN NORCROSS: Well, the fact is, Matt, if I were to say to you that there's a one in ten chance that you're going to die if you don't fix that wheel on your car when you leave the studio this morning, probably you'd fix it and most people would fix it. But not everybody would. And if you equate it in that kind of way, you know, the fact is that we don't know for sure, but the odds were significant enough of a threat to life, and more than property, but especially to life, if we didn't take action, that maybe one in ten chance. NORCROSS: Would you deal with a one in ten chance of life and death? Most people would not. LAUER: Al, is there a chance, though, that people who left their homes and were inconvenienced by the evacuations and the shut-downs of transportation systems during this storm are going to be less likely to leave their homes the next time they get warned of a storm approaching? LAUER: And might that not put them in harm's way? ROKER: It absolutely will. But they need to keep in mind, again, 23 people are dead. And you know, look, if there's a bear outside your door and I see it and I don't say anything to you. I'm irresponsible. Doesn't mean the bear is going to get in there and get you but you need to know that it's there. LAUER: There's another aspect to them, Jim. When this storm made landfall in New Jersey and New York. We were seeing reporters in the field talking about sustained winds of 45 miles an hour, 55 miles an hour. Now in all the years we've been reporting on hurricanes, that is not a Category 1 hurricane. In your opinion, did the National Hurricane Center keep this storm labeled a Category 1 hurricane simply to keep people afraid and safe? And is that appropriate? LAUER: But that's not in the past how we've labeled hurricanes. When they hit Florida and the coast of – the Atlantic coast, we call them Category 1 if it's 75 miles an hour, sustained and above. That's not what happened in this one. Why? ROKER: No, but as it's coming up the coast it was still technically a hurricane. And you have to make sure that people are prepared for this. Now, is it going to die down? Yes, it did. But on the back side of the storm, like in Long Beach, we were getting 65, 70-mile-per-hour wind gusts. So, you know, you absolutely have to err on the side of caution. CANTORE: Out on the Battery, the strongest winds came after the storm moved to our north. So same thing here. LAUER: Al Roker, Jim Cantore, Bryan Norcross, guys good job yesterday and thanks for doing this with us this morning, appreciate it. LAUER: And what do you think about this? Was Hurricane Irene over-hyped? Head to our website, Today.com, let us know. We'll tell you the results of what you had to say.